For this wonderful salad from Yotam Ottolenghi’s Plenty More, I decided to add some langostino to the mix to make this more of a heartier meal than just a salad. And what a salad it is, regardless if you are not a grazer of the greens. 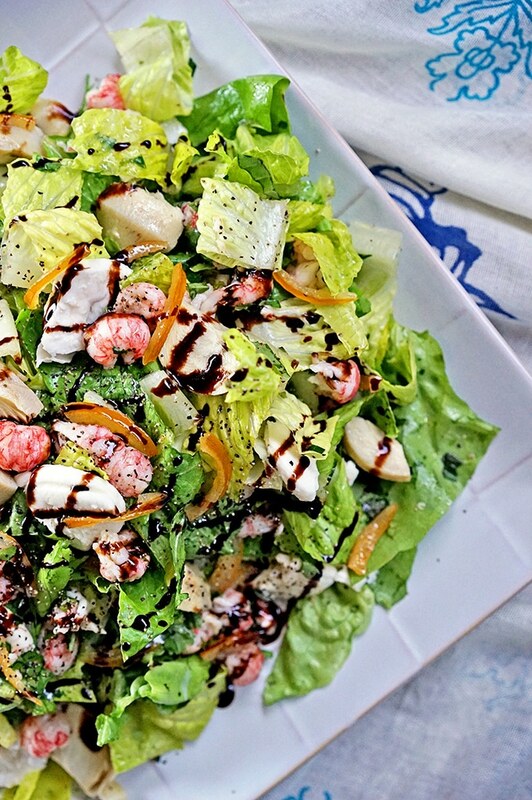 This Langostino Salad with Artichoke and Mozzarella with Candied Lemon packs quite a punch in texture and flavors. Langostino to me are the result of a shrimp and a lobster if they decided to have kids. These little nubs of sweet, delicious seafood are so good in salads, marinated like in my Langostino Ceviche, or any way you would use lobster. Langostino means “little lobster” in Spanish. Although it’s taste and texture are similar to lobster, langostino is not a lobster by any means. I grab them whenever I can at Costco in the 2 pound bags and keep them in the freezer for a little something different every now and then like this Langostino Artichoke and Mozzarella with Candied Lemon Salad. 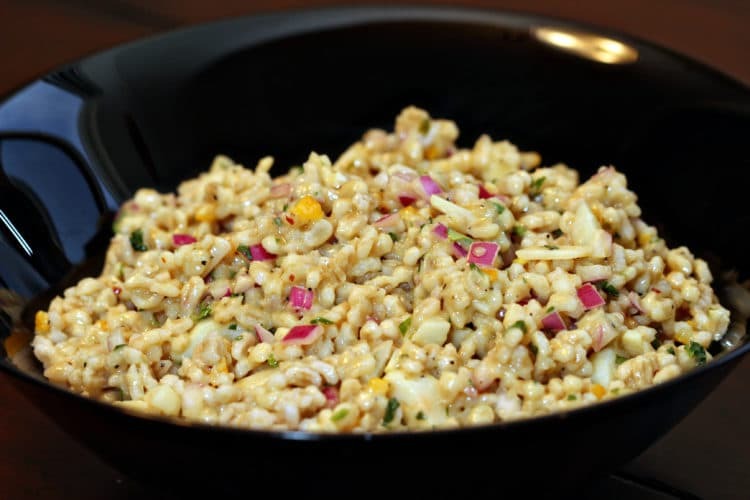 The candied lemon were a cinch to make in 15 minutes and added so much to this salad. Don’t skip them, they make this. 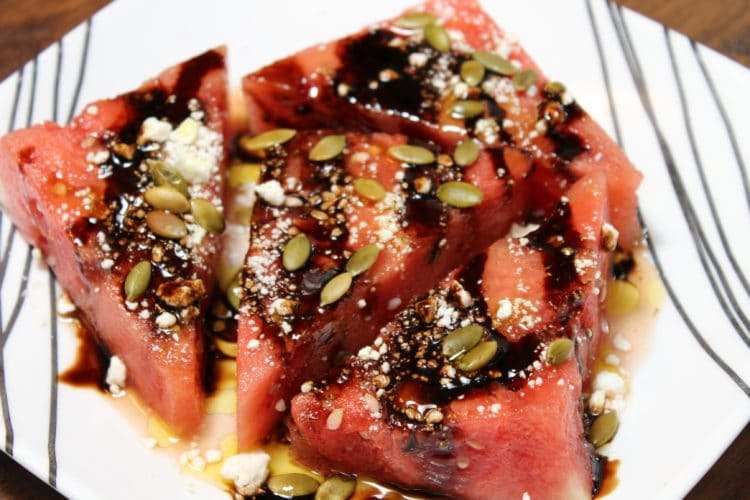 I also added a good healthy drizzle of balsamic syrup, but feel free to omit if you like. 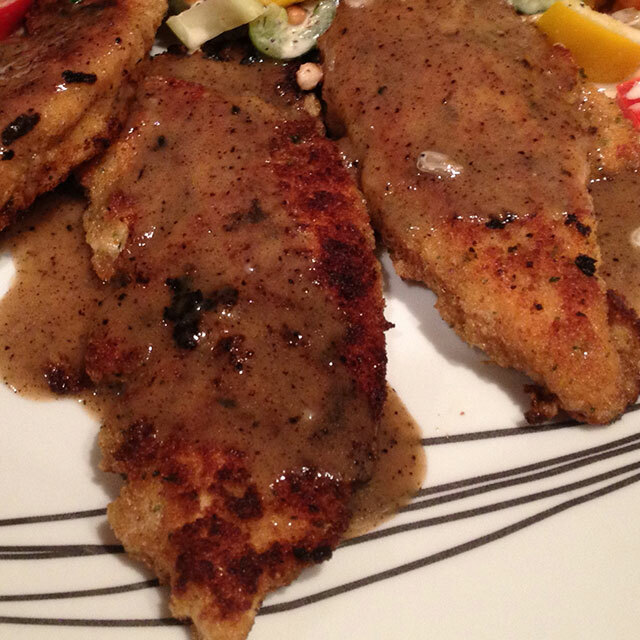 I also used jarred and marinated artichoke hearts and this meal came together in no time. 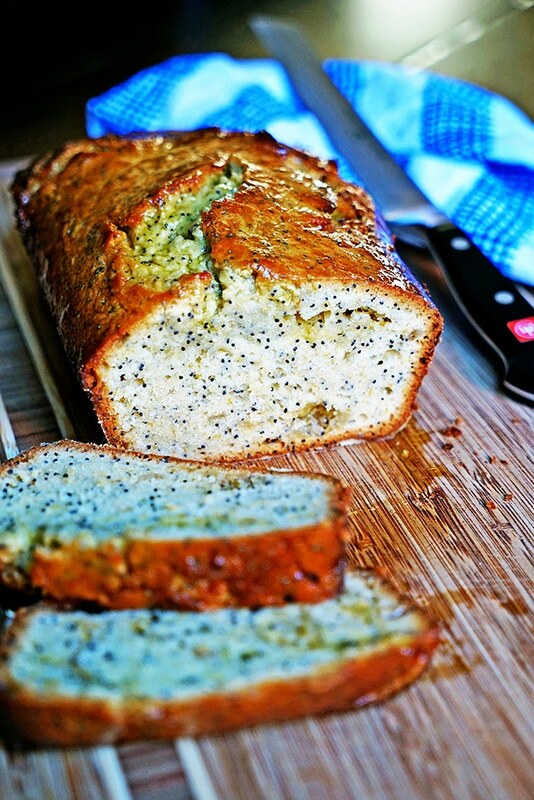 Perfect for the quick and healthy meal after a long day at work. 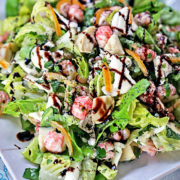 The fresh bright herbs of basil, parsley and mint wake up the tastebuds with a beautifully dressed butter leaf and romaine lettuce salad, too. All made in 20 minutes tops and what a healthy, wonderful salad it is. 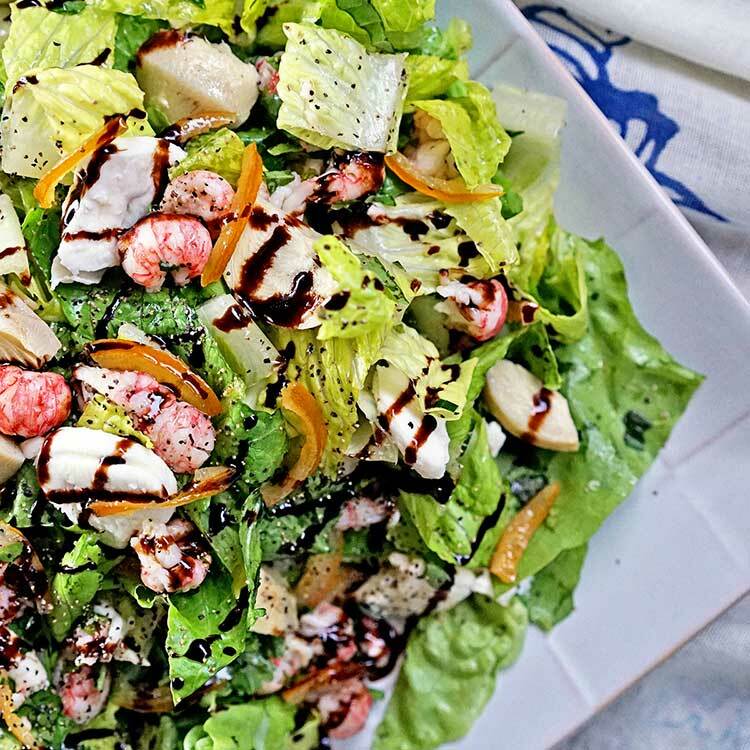 Even if you don’t like salads as a meal, try this one out, you will not be disappointed with mozzarella and langostino, come on! 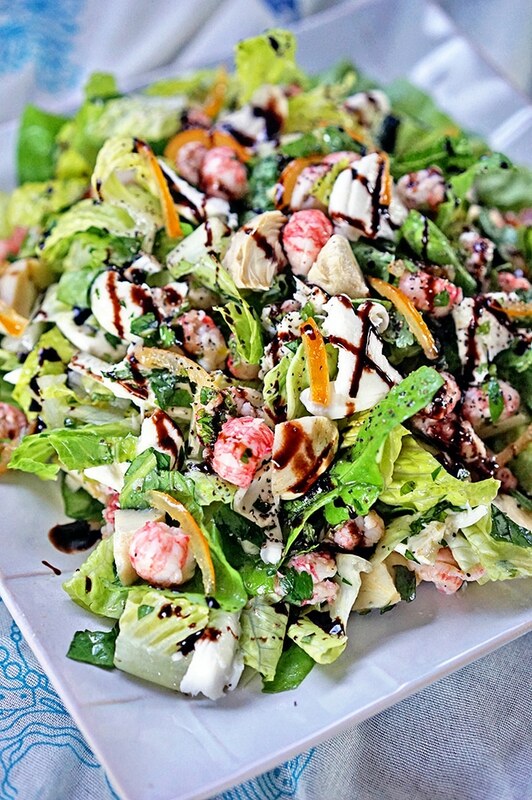 Langostino Salad with Artichoke and Mozzarella - Mixed lettuce, langostino (or shrimp), mozzarella, artichokes and candied lemon in a herb dressing. Rinse and drain langoustino and artichokes. Chop artichokes into bite size pieces. Set both aside. Use a vegetable peeler and shave off strips of lemon peel, avoiding the white pith. Then cut into thin strips and place in a small saucepan. 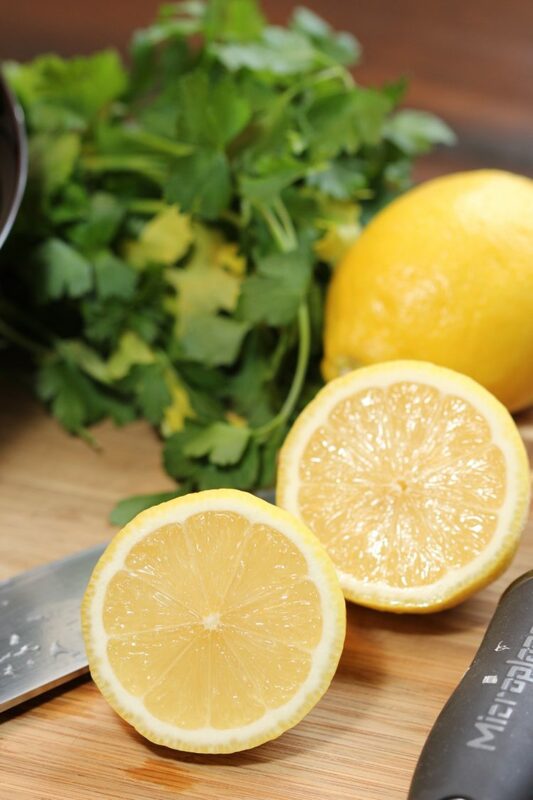 Squeeze the lemon juice and add enough water to make 7 tablespoons total, pour over lemon peel and add sugar. Simmer for 15 minutes, stirring until the light syrup is reduced to one third and lemon is all sticky and coated. Set aside to cool. Whisk together the olive oil, garlic, parsley, basil, mint, salt and pepper. 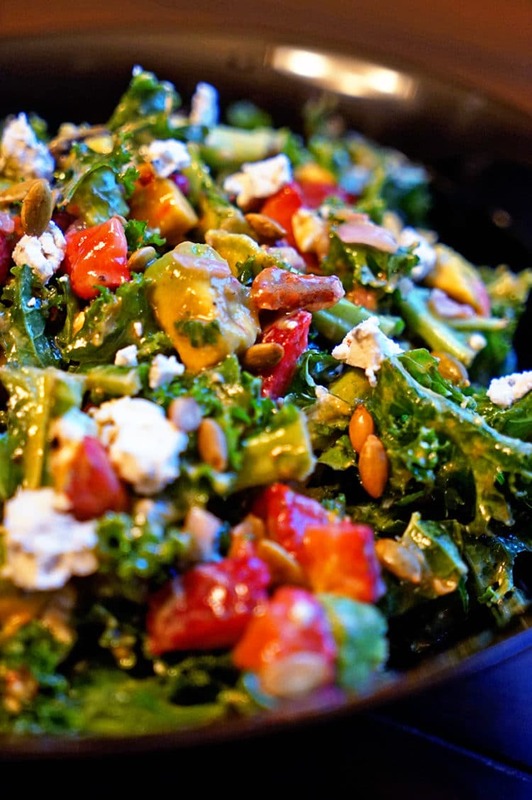 In a large salad bowl add both lettuces and toss to coat with half of the salad dressing. 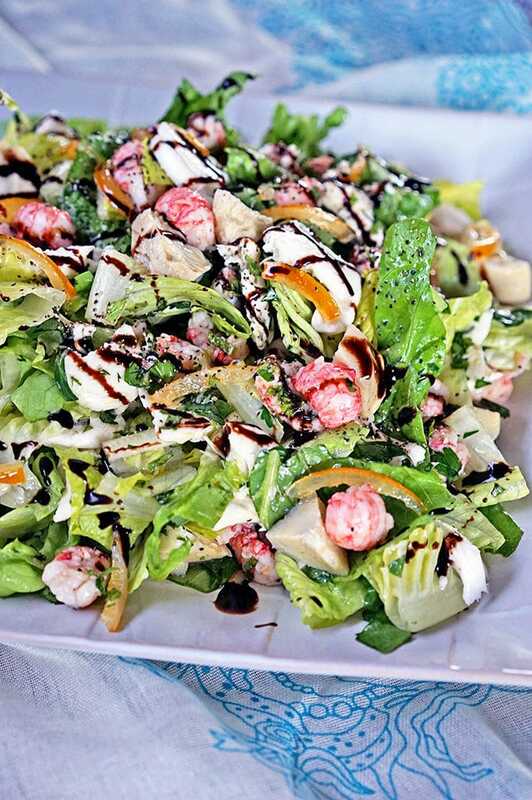 Arrange dressed salad greens on a platter, dot with torn pieces of mozzarella cheese, artichokes and langostino. 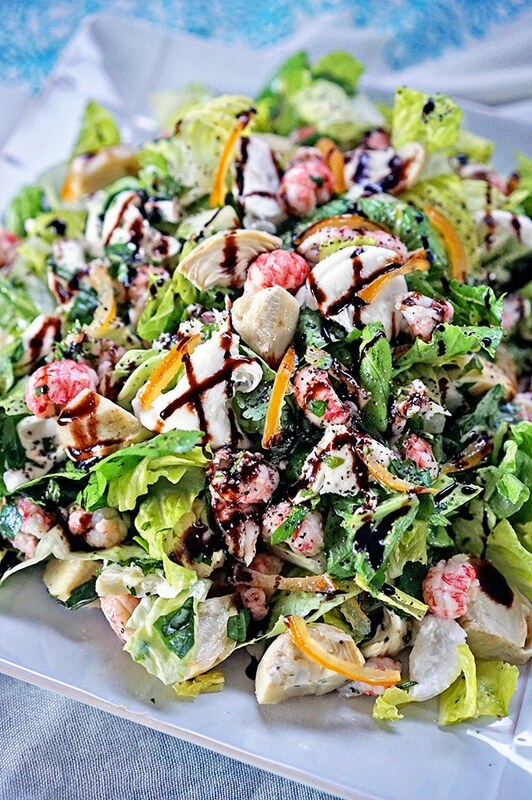 Sprinkle the candied lemon pieces on top using a fork, drizzle balance of dressing and the optional balsamic syrup. Add freshly cracked black pepper on top and serve. Plenty More is such a great cookbook. You did a beautiful job with this salad. The addition of langostino is sheer genius, Kevin ♡ Ah.Mazing, as always!! Cheers, buddy!! Thanks so much Cheyanne, much appreciated! I LOVE the sound of the candied lemon in here. I’ve candied lemons before to use in desserts, but never thought of using them in a salad. Brilliant! Thanks Kristen, it added that little extra something to the salad and the langostino made it more of a meal. Glad you came by and visited my site! Hey Kevin! 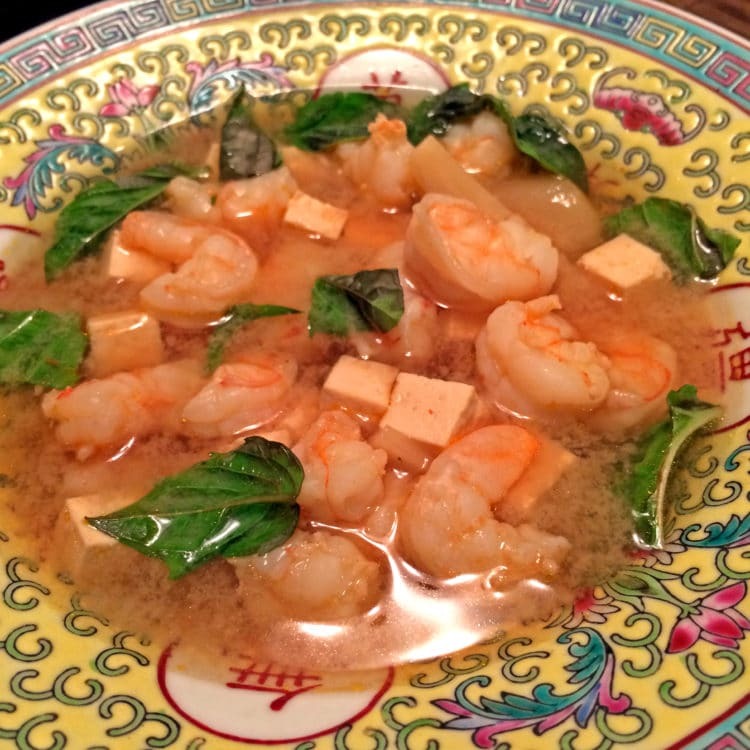 This looks like a perfect hot weather supper! I have crawfish tails in the freezer, all the herbs and lettuce in the garden and artichokes in the pantry – so I’m all set! Thanks! Sounds like you are in for a tasty dinner. 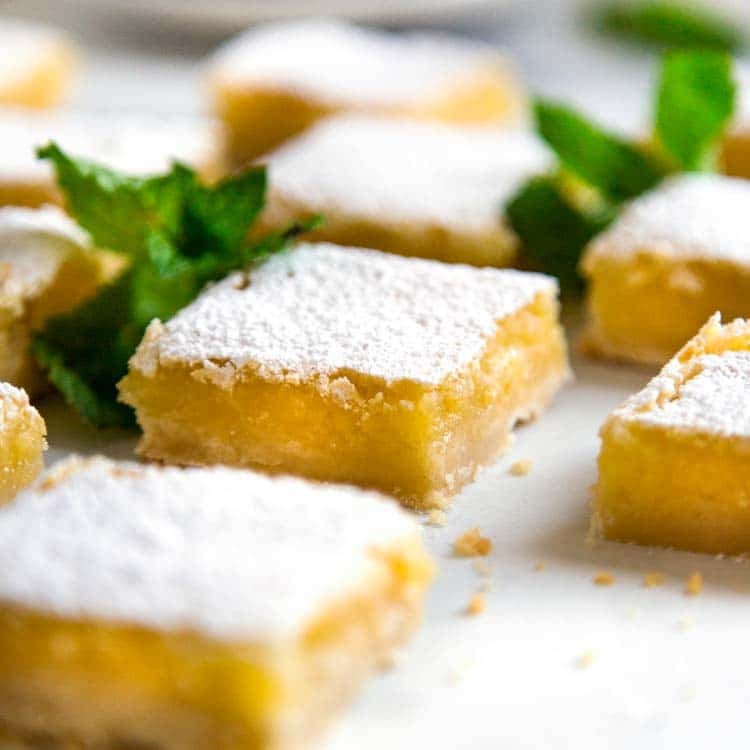 The candied lemon makes it, enjoy!